Registration now open! Show tickets available! 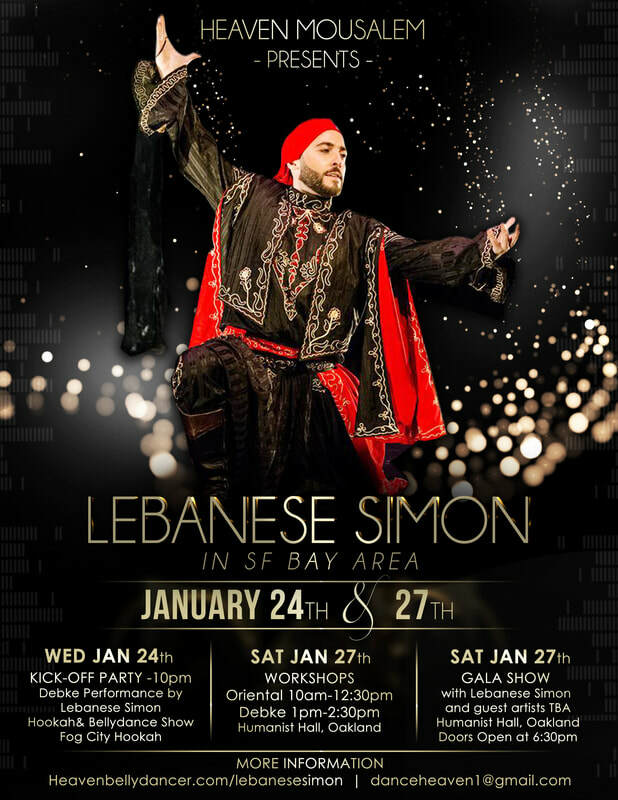 The wonderful Lebanese Simon will be visiting the SF Bay Area for workshops and performances. Debke performance by Lebanese Simon! A timeless movement that prevailed with the evolution of art and among the dancers of the golden era (Tahia Karioka, Samia Gamal, Nadia Gamal to name few) to today's biggest names of oriental dance. A minimum of 16 stylistic arabesque movement are explained with emphasis on correct execution, historical reference, leading into the most modern technique and execution. Simon will explain his signature creative process to creating his own series of arabesques appropriately selected for each genre of music (classical oriental, shaabi, baladi, modern). This class begins with an introduction to Lebanese dabke: the basic 6 count line dance with three combinations of different levels of complexity, and the different rhythm and lyric dialect variations used. The class continues with dance combinations showing the influence of folklore and the Bedouins of the Middle East on the Oriental style. We will drill the combinations to complete a high energy intermediate choreography combining oriental concepts with folklore transitions and combinations. Please bring plenty of water and shoes that provide good arch support, suitable for energetic dance. To pay by check email danceheaven1@gmail.com for instructions. You will receive email confirmation of your payment, thank you!